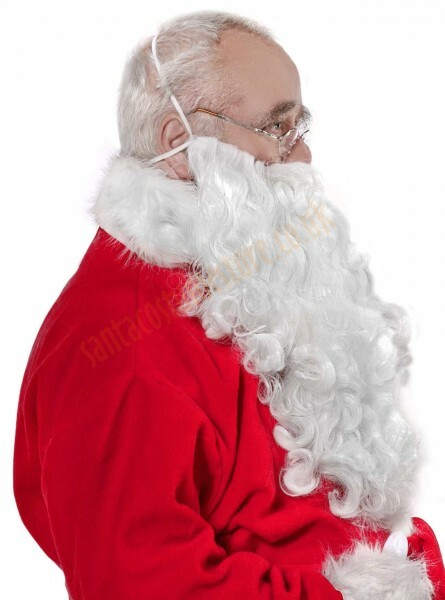 This DELUXE version of the fleece Santa suit with jacket features more luxurious faux fur, and the set also includes a thick beard with wig, making Santa look even more dignified. The full set has as many as 17 matching parts. Why is it worth choosing the deluxe version of the Santa suit? 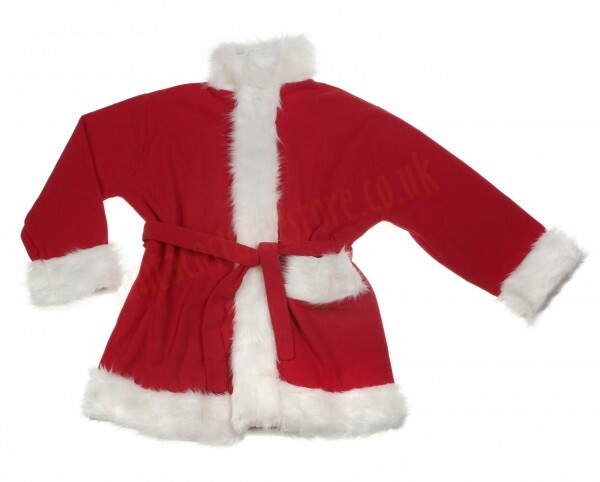 The deluxe version of the Santa suit is made of top quality materials: soft and strong fleece, in a deep red colour, trimmed with a 4" (10 cm) wide band of ecru faux fur (2"/4.5 cm pile). Thanks to such details the costume makes a striking impression! 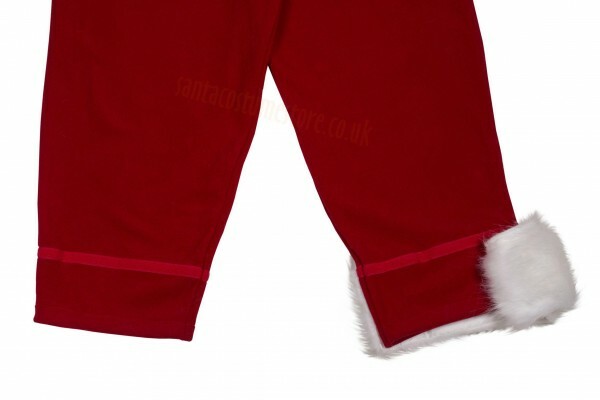 Two side pockets are sewn into the trousers, and its legs feature detachable fur, thereby making it possible to tuck the legs into the tall Santa boots. Our deluxe costume sets come by default with a longer-than-standard beard (measuring as much as 15.5"/40 cm!). 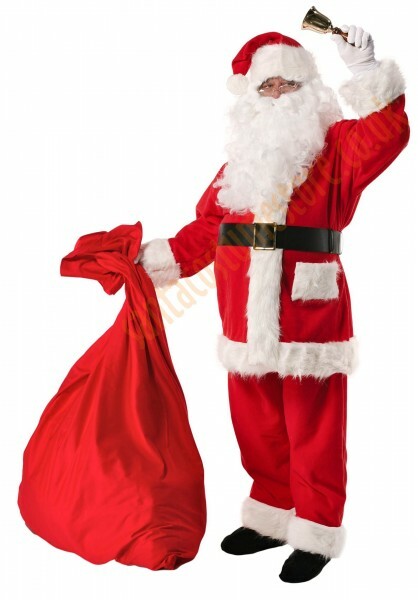 What is included in the complete set with the deluxe version of the Santa suit? 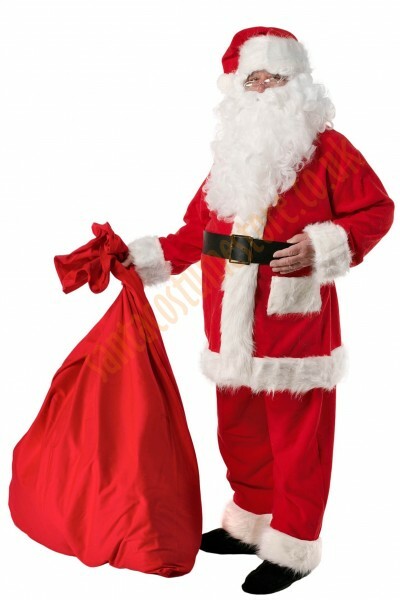 The deluxe version of the complete Santa Claus costume contains: fleece jacket, trousers and hat; a long beard (15.5"/40 cm) with a wig and special glue for holding it in place; a black belt with a metal buckle; long gloves; a large sack (43.5" x 55" / 110 x 140 cm); smart boot covers; a Santa belly; neutral-lens glasses (with a case); a brass bell; a T-shirt; and a garment bag with a hanger for the costume. Santa’s jacket fastens with a zip, two strong Velcro patches and a belt – so there’s no way it will come undone while Father Christmas is handing out the presents. The jacket features an outside pocket that Santa can use for letters from children or sweets for them. 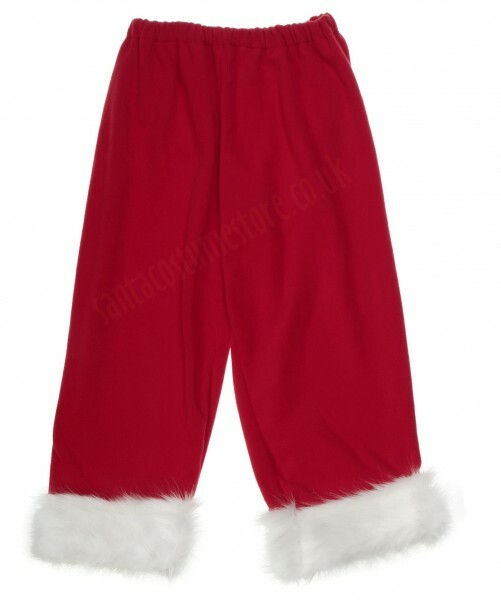 The Santa trousers are fitted with elastic at the waist, and thereby fit every figure. The band of fur is detachable (held in place with strong Velcro), and so the trouser legs can be conveniently tucked into tall boots. The hat comes trimmed with a broad band of deep-pile faux fur, and is adorned with a fluffy 3" (7 cm) diameter pompon – making it particularly festive. A smart Santa Claus outfit also needs accessories that are equally as smart; the standard fleece belt might come undone, but there’s no chance of that happening with the solid black leather belt! 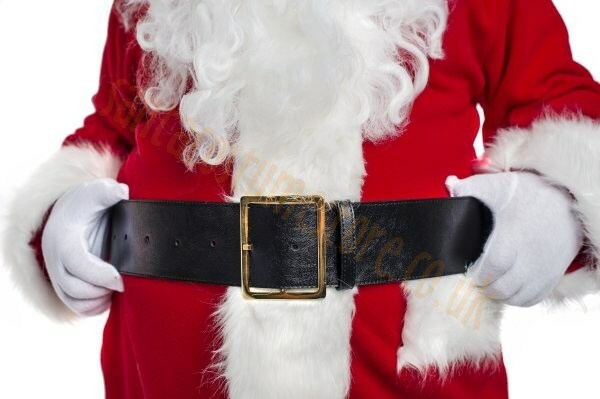 Santa’s belt is made of artificial leather, and comes reinforced with a textile insert. Impressively broad (3"/7 cm wide! 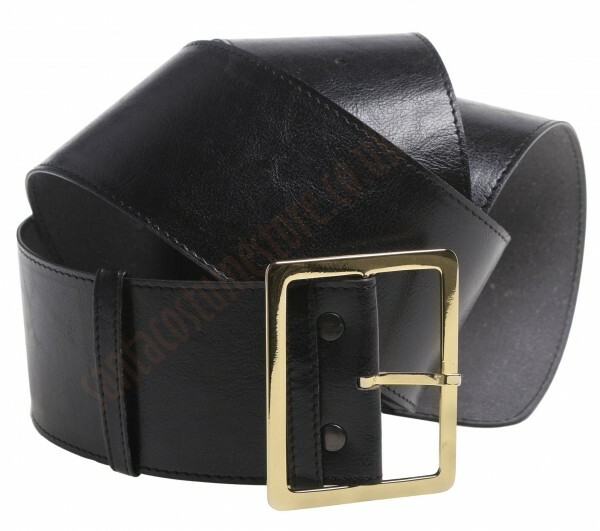 ), the belt also features a beautiful buckle, light gold in colour, so it will certainly be noticed. 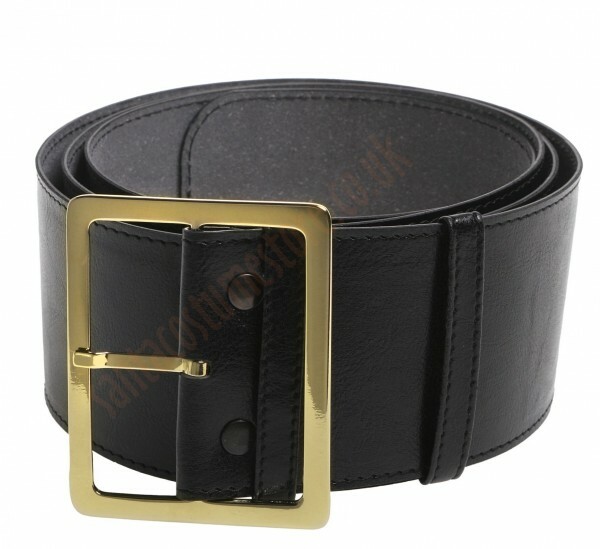 The belt can fit all belly sizes (and it doesn’t matter whether we’re talking of the wearer’s own or a fake belly), since it has as many as 26 holes and 2 belt loops, and totals 65" (165 cm) in length. It complements the Father Christmas costume wonderfully. 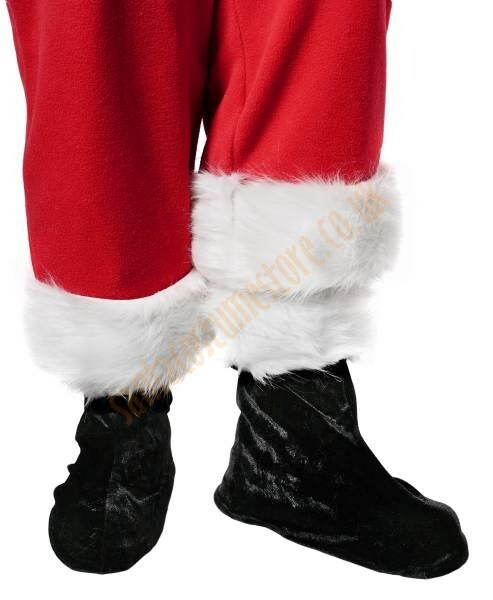 The Santa boots are in the form of velvet boot covers that imitate high-top boots. 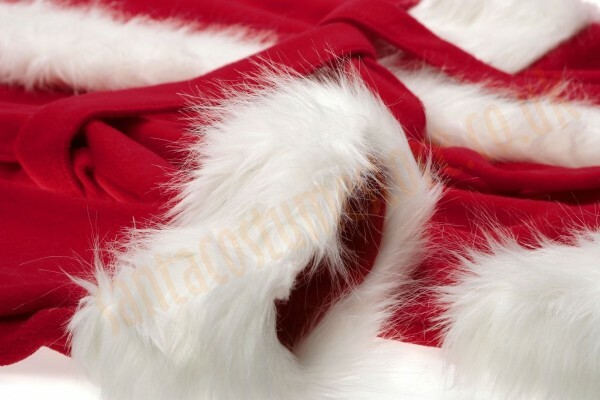 They are trimmed with a band of faux fur identical to that in the deluxe version of the Santa Clause costume, and as such suit it perfectly and help complete the picture. These covers can be worn on top of any footwear, although you have to bear in mind that the sizes given in the Sizes and options apply to when they are worn on typical winter boots; if they’re to be used on lighter shoes, they will also fit shoes 2 sizes larger than given. Santa’s boot covers are held in place with elastic straps – one at calf height, and two that fit beneath the soles. Father Christmas has no need to worry about being identified because of familiar shoes. 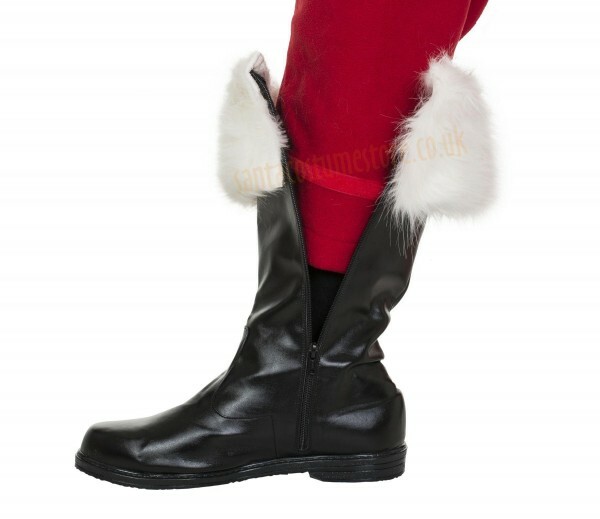 Tall artificial leather boots or exclusive Santa boots made of real leather (and also trimmed with matching faux fur) are also available as options. 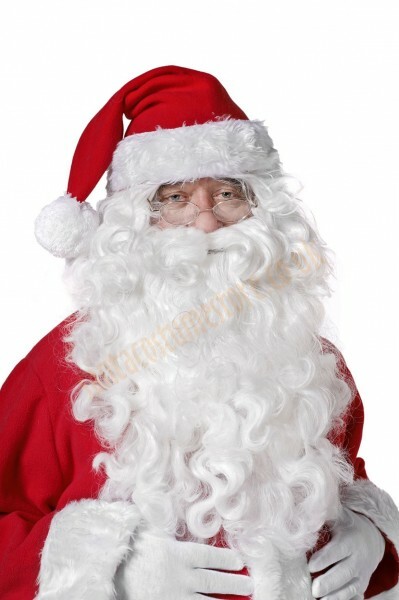 The long and thick Father Christmas beard comes with a wig, moustache, and self-adhesive eyebrows. 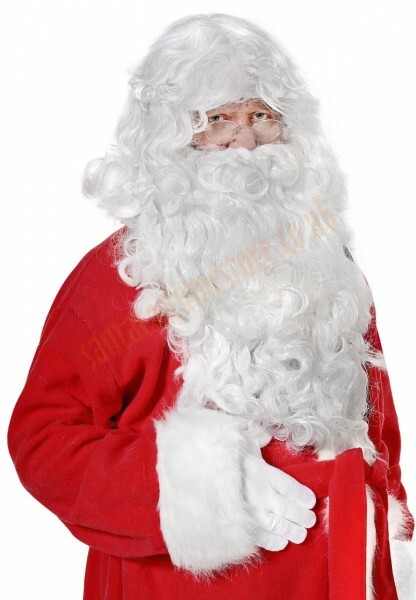 The beard is 15.5" (40 cm) long, its hair gently curled (other beards are also available under Sizes and options), and comes in a warm white colour – perfectly matching the fur on the deluxe Santa suit. As a standard the beard is attached with two elastic straps, although you can also use special beard glue (in the set). The wig’s hair hangs to the wearer’s shoulders, and easily covers their real ears and the beard’s straps. A German product. 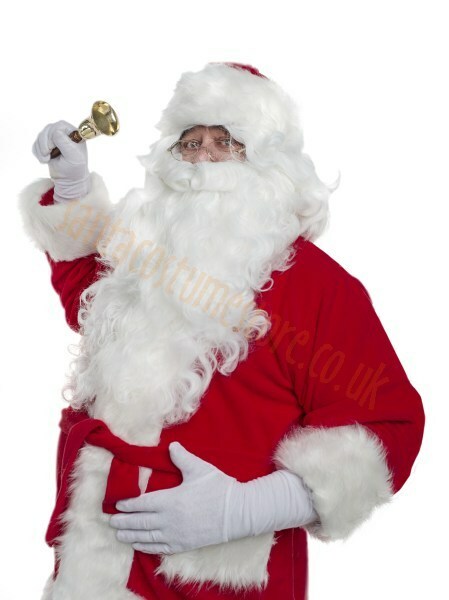 You’ll definitely feel like a real Father Christmas in such a costume. Children are very observant, and though it might seem unlikely, hands alone can be very distinctive. Such a beautiful Santa Claus suit, and a perfectly fitting beard… it would be a shame to spoil the effect with Dad’s watch poking out from inside Santa’s sleeve. Our long white cotton gloves stretch a full 7.5" (20 cm) above the wrists, so even when you stretch your arms your skin won’t be seen. Gloves might seem just a minor detail, but without them – the entire Santa suit loses a lot. Our comfortable T-shirt worn beneath the jacket will keep you feeling comfortable, with no need to worry about any familiar clothes showing anywhere. 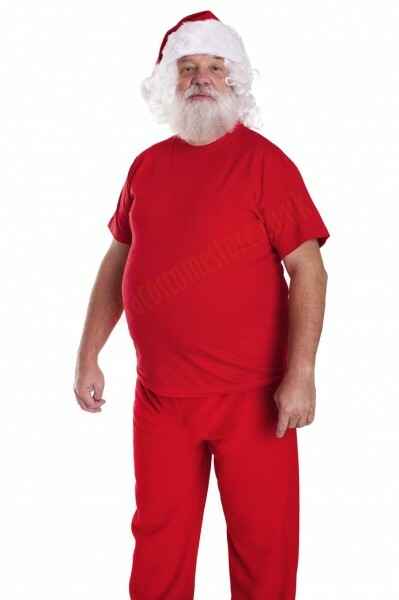 In addition the T-shirt protects the Santa costume from absorbing sweat. The T-shirt is made of high quality cotton, and has double-stitched seams; it won’t pill, won’t shrink and won’t bleed. It can also be worn as an ordinary everyday T-shirt. Available in one universal size (XL). 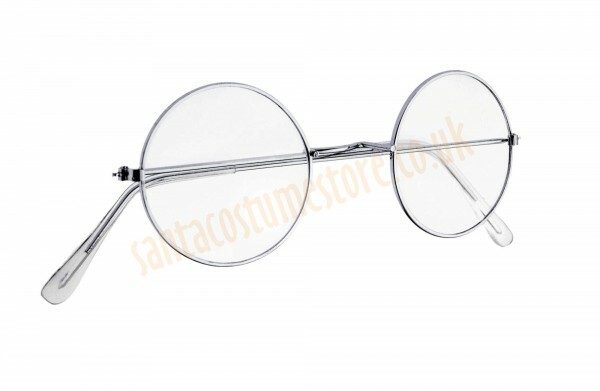 Santa’s glasses – with neutral lenses in metal frames – give Santa Claus that dignified look. And with corrective lenses fitted, they also make sure poor-sighted Santas have the right appearance. 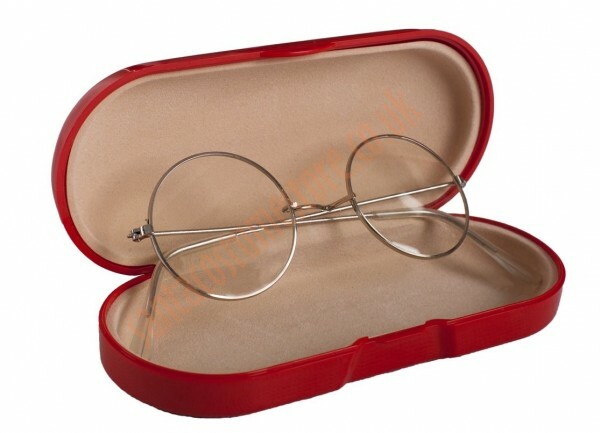 In order for the glasses to serve as long as possible, we include a FREE rigid case; it might look different to the one in the photo, but will always be hard and lined on the inside. 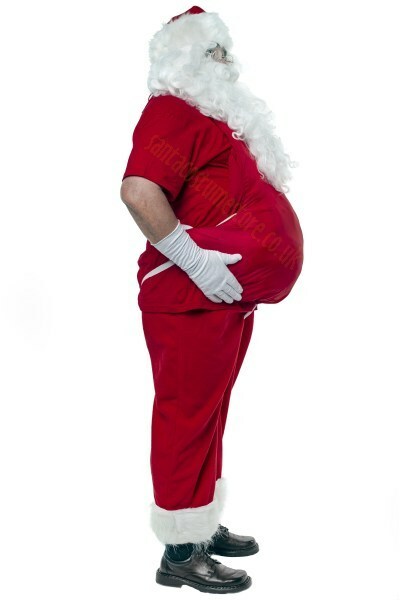 The fake belly worn beneath the Santa outfit means that no matter what size your own belly, you’ll have the right posture. 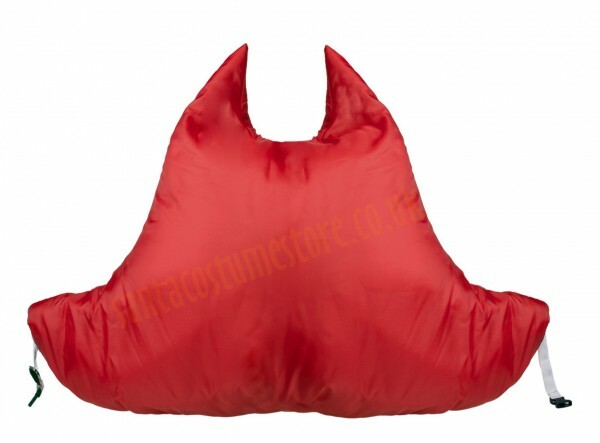 The belly is made of red material, with cotton on the side worn against the body (making it breathable). It is attached in a few places to guard against it changing position while Santa is at work. 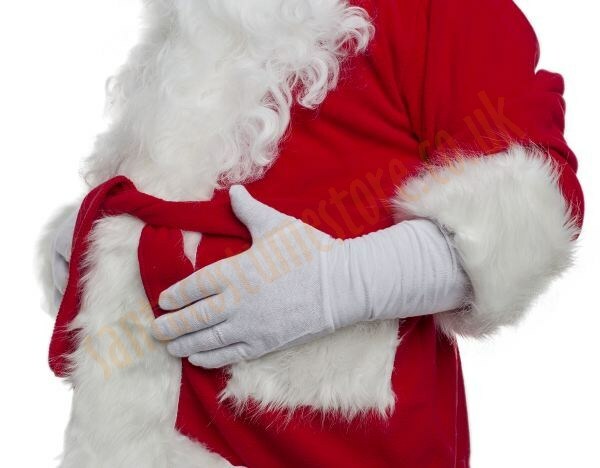 Our Santa Claus belly is tied at the neck, has a buckle at the waist, and also features additional elastic straps for the wearer’s legs – all going together to make sure the belly is adjustable, and can perfectly fit anybody’s figure. 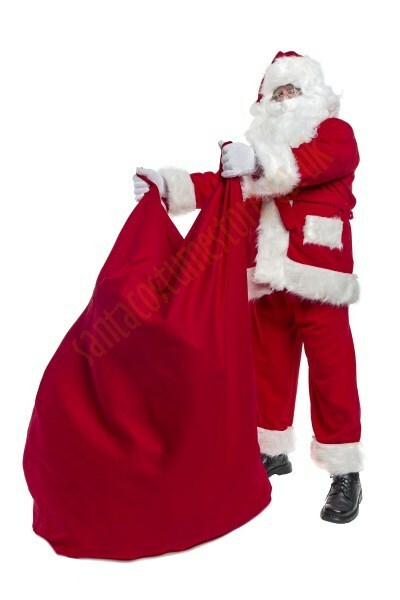 Santa’s sack is something that immediately draws kids’ attention. As such it’s well worth making sure that it’s dependable. 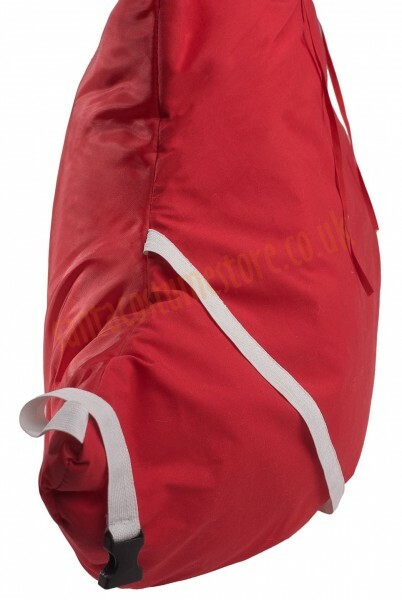 Measuring 43.5" x 55" (1.1 x 1.4 m), our red Santa sack is made of strong denim-canvas, and features a double-stitched seam to make certain that won’t come apart. 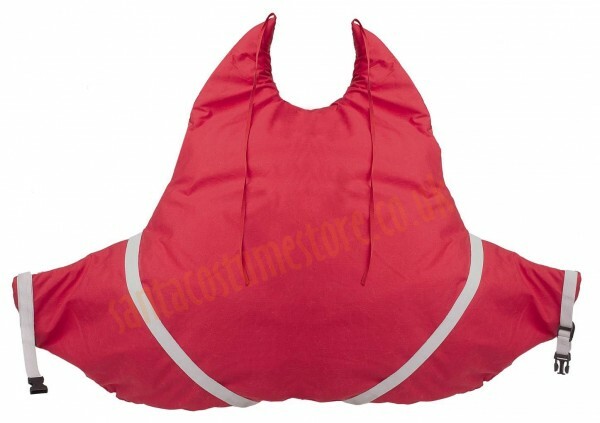 It also comes fitted with a drawstring so that even the smallest of gifts won’t fall out. A dirtied sack? That’s no problem – before you give it a good wash, you can turn it inside out and then you still have a clean sack for emergency use. 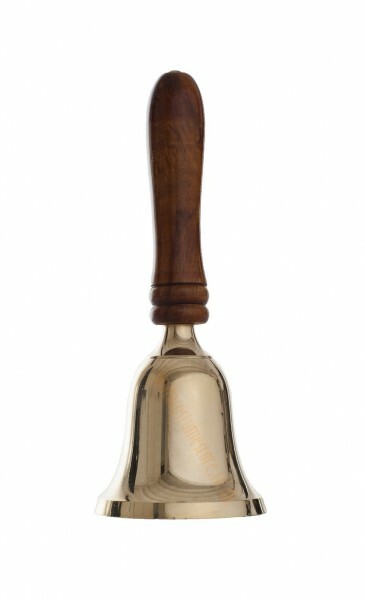 The Santa bell is an indispensable attribute of Father Christmas. It announces the arrival of our Christmas guest with a sack full of presents, and when he’s there it helps focus children’s attention. 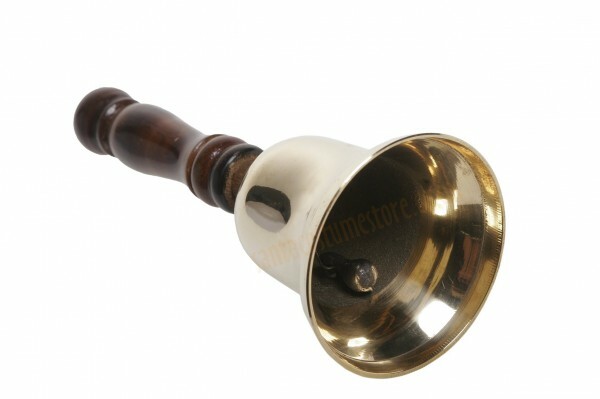 Made of brass, 6.5" (16 cm) tall and with a bell diameter of 3" (7 cm), it has a brown wooden handle; there are other bells to choose from under the Sizes and options. 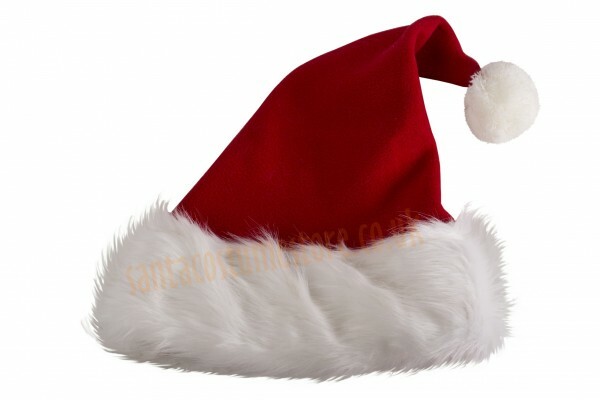 Its old-fashioned appearance goes well with the Santa Claus costume. You can hear how it sounds by clicking here. 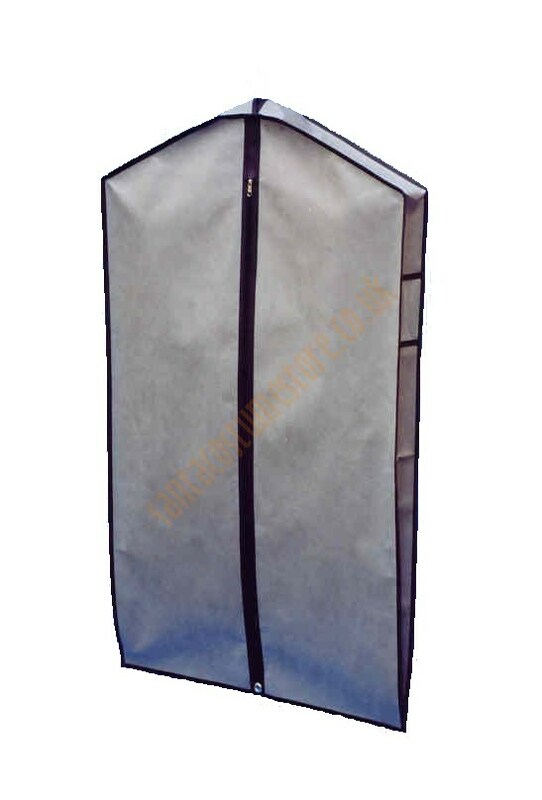 Our Santa suit garment bag is excellent for storing your costume and, if necessary, for taking it from one place to another. It certainly won’t give away its contents, while its inconspicuous grey colour is unlikely to arouse children’s interest. Size: 49" x 24" (125 x 60 cm). 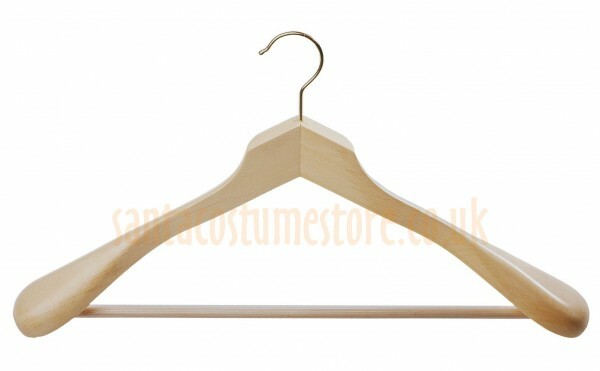 The sack comes with a broad wooden hanger (or you can choose a plastic hanger under Sizes and options). Are you worried about children pulling at your beard and busting your cover? If so, use our special MASTIX beard glue (used by professionals). It’s very strong, but doesn’t irritate the skin – and can be washed off with water or glue remover. A small 2 ml container is enough for 2-3 users. If you’re planning more occasions, larger versions are available under Sizes and options. Producer’s guarantee: 3 years (although we know from experience that the glue remains good for much longer). A smart version of the fleece Santa suit – really worth it!